Fred Dickey Funeral & Cremation Services is the only funeral home in the area to have a grief support dog on the team. 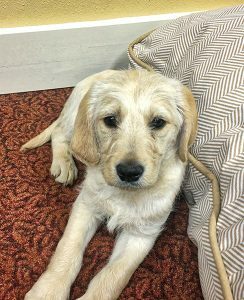 Teddy recently joined our family and is in training to become a “Grief Therapy Dog.” He is already proving to be a welcomed, and very popular, addition to our funeral home. We invite you to contact us to learn more about the comfort and care Teddy can provide.